Jeanneau has just announced the all new Merry Fisher 895 Marlin for its world premier at the Paris Boat Show (December 2018). 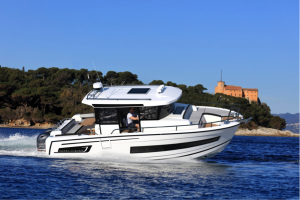 Boasting the same remarkable hull as the recently launched Merry Fisher 895, an ultra-stylish deck plan and an inviting interior layout, this new model features a very innovative approach from this iconic line by Jeanneau! Above all, the Merry Fisher 895 Marlin will be a boat with a very distinctive personality!